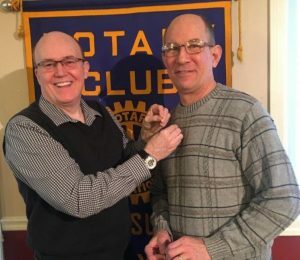 FULTON – At a recent Fulton Sunrise Rotary meeting, Dennis Merlino, was inducted as a new member. Dennis Merlino, right, and Patrick Waite. Merlino is retired from P&C/Tops and is a member of the Fulton City Council. Welcoming the new member is Rotarian and sponsor Patrick Waite.